San Diego's relievers combined to strike out more than a batter per inning over the course of the 2010 season, while limiting hits, walks and homers. Manager Bud Black saw five of his relievers appear in 30 or more games and emerge with ERAs under 2.00 at the end of the season and the Padres' NL West rivals weren't the only ones to notice. 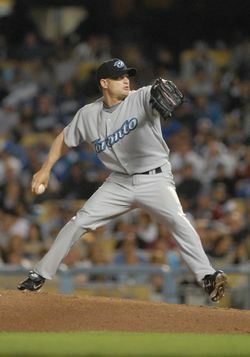 Blue Jays GM Alex Anthopoulos says he'd like to have a deep bullpen in 2011, like the Padres did last year. He says he's happy to keep more relievers than usual on his roster this year and that the acquisition of Frank Francisco doesn't mean a trade is imminent. The Blue Jays' plans for their relievers haven't changed. "No impact at all," Anthopoulos said yesterday on a conference call to announce the acquisition of Francisco from the Rangers. "They're all quality relievers and we love having depth in the bullpen one through seven." Or maybe one through eight. The Blue Jays have discussed the possibility of opening the season with an eight-man bullpen to accomodate their arms and provide manager John Farrell with a variety of options. Though the Jays could open the year with an extra arm in the 'pen, Anthopoulos said a traditional seven-man ensemble is more likely at this point. The Blue Jays' rotation is relatively young and inexperienced, so the team's front office would like to support starters like Brett Cecil and, possibly, Kyle Drabek with steady relief pitching. "It's certainly part of it," Anthopoulos said. "We don't want to overtax our young starters." The Blue Jays don't want to overtax their relievers, either. Anthopoulos says there can be a ripple effect when teams have deep bullpens. If every reliever is capable of performing in meaningful situations, no pitcher gets overused. But Anthopoulos has no illusions; even qualified, well-rested relievers struggle and the 2011 Blue Jays won't be any different. "We all know that they will get hurt," he said. "Some of them won't perform. They'll have bad months." Take Jason Frasor (pictured), one of the holdovers in the team's new-look bullpen. He walked nearly a batter per inning in April, 2010 and posted an 8.38 ERA through the season’s first month, but recovered from his turbulent start and put together a fine year. He'll join Francisco and free agent signings Jon Rauch and Octavio Dotel, the relievers Anthopoulos expects to compete for the Jays' closing job. Shawn Camp, Casey Janssen and Carlos Villanueva are also right-handed relievers under team control for $1MM-plus in 2011, so the Blue Jays have a surplus of big league arms and could hear from pitching-starved teams before the season begins. The Jays have seven established right-handed relievers, but Toronto's left-handers have considerably less experience. David Purcey, an out-of-options 28-year-old, was reasonably effective in 2010. He's a leading candidate to make the club, though his walk rate and fly ball rate have been high throughout his brief MLB career. Jo-Jo Reyes is also out of options, but he has made just 11 relief appearances as a pro. Jesse Carlson, who was a mainstay in 2009, could also crack the team's roster. While their AL East rivals to the south, the Rays, had to lower payroll this offseason and rebuild their bullpen on a budget, Anthopoulos reaffirmed that he has the flexibility to ask for more money if necessary. The Blue Jays can continue spending on their bullpen, even as their young starters become more expensive. The Jays lost Gregg and Downs while picking up supplemental draft picks…then went out and built what looks like the best bullpen in the East…..not too shabby. AA is putting BULLS in the PEN!!! I like their moves. This is what Moneyball was all about – finding an attribute undervalued in the market so that a limited budget can be most effectively spent. For the A’s, then it was OBP; apparently for SD and Toronto, now it is middle relievers. Also, Toronto has skillfully flipped middle relievers at the trade deadline, so AA probably figures he can do the same this upcoming season if they are out of contention. My bad, thanks for calling me out on it. I remembered all the discussion of how they were going to trade Gregg and Frasor to contenders… but forgot that they didn’t actually do that! Has the makings of a really good bullpen. 1 lefty …which means as least carlson or a call up lefty will be in the pen in place of one of these guys. I doubt it. Francisco can handle lefties pretty well.. I believe Accardo was making over a mill and didn’t play much at all. Villanueva is a long man and that’s a role Jansenn should be able to do. Even Camp can go 2-3 innings. Purcey could probably be used as a middle reliever, LOOGY and even a long man. Francisco, Frasor, Rauch, Dotel, Camp are all pretty much locks to be in the pen. Purcey being a lefty and pitching well last year almost makes him a lock. It’s down to Villanueva and Jansenn. I would still look to trade one of the right handed pitchers. Also potential candidates: Mills, Cordero, Ledezma. Looks like Carlson spends another year at AAA. I think Carlson’s time is over. His fastball in his first year was just so exceptional because of his delivery, but now that everyone knows the ball wont sail up and hit them in the head you see just how weak his fastball actually is. Another year in AAA or send him to the NL were he hasn’t been as exposed as he has been in the East. Hopefully they’ll send Jansen down for the beginning of the year as well as Roenike. With all these ‘vets’ we just don’t need them or have the space. Its too bad — i thought Jansen was great, pre-injury. He looked like he could be a real steady 7th/8th inning guy for years..
And we inexplicably tried to move him back to the rotation where he predictably got hurt. Sic Bullpen, And also remember Chad Cordero was signed and might regain his form in AAA and be called up. Remeber when the Jays had Troy Glaus, Vernon Wells, Alex Rios, Lyle Overbay, Arron Hill, Bengie Molina, Frank Thomas, Doc, Burnett, Ted Lilly, and BJ Ryan under contract in the same season? I don’t think the Jays had Molina and Thomas in the same season. Bengie was only 2006, Thomas came on board in 2007. But, please, don’t remind us! This puts AA sitting the catbird seat. He only has to offer one-year deals to the reliever. If he loses them, he gets a good draft pick. When he shops them at trade deadline, he can hold out for a high price like he did with Downs. Please not, he is accumulating “real” assets that can be added to the deal. Assets tangibly better than Tim Collins and Tyler Pastornicky. As a result, the probability of success for getting a big deal goes up. AA reminds me of the Montrealer who started by trading paper clip on Craiglist with the intent of getting a house. After a year of many trades, the Montrealer ended up getting his house…..for a “paper clip”!! I can’t help but wonder if they are related. Didn’t Janssen go to Seattle for Morrow? Nope, that was League. Brandon for Brandon swap. I like Frank, especially when he is throwing chairs at Oakland fans, but I think Jays fans shouldn’t get overly excited about him. He was demoted for a reason. It may not seem like he had a lot of blown saves the last few years, but the ones he had hurt and the ones he got last year were especially bad given that he was a setup guy and only had rare save opportunities. Maybe he’ll regain his form and relearn how to shut down the other teams to close games out, but obviously the Rangers felt like he didn’t have as much upside as bringing in Napoli did. I don’t worry about the Rangers bullpen because it is pretty stacked as is and then you add Tanner Scheppers to the mix and Mark Lowe (if healthy)..it is all good. This is the last season (before the CBA expires) to abuse the system and net extra draft pick so AA will try to sign as many FA to 1 year deal as he can. Hope that it won’t back fire when they are offered arb. No good FA will ever accept a 1 yr deal, hence you see AA loading up on FA relievers instead. Besides, this absolutely delay the need to throw the club’s young pitching prospects (E.g. Stewart to be the closer) into the pen; therefore, starting their MLB service clock later. Think that Frasor and Rivera are on their way out of town; AA never want anyone of them in the first place. When AA was asked who will be the closer in 11, Frasor was not mentioned. Hopefully they will get someone good in return.